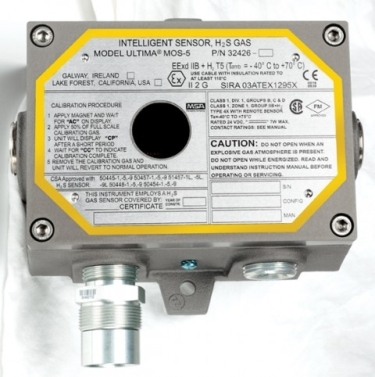 The ULTIMA MOS-5E Hydrogen Sulphide Addressable Transmitter is a highly reliable, self contained, micro processor-controlled single point monitor with integral 3 digit readout. It is designed to measure and display concentrations of H2S in three ranges: 0-20 ppm, 0-50 ppm or 0-100 ppm, but will continue to display concentrations up to 120 % FSD. The sensing element may be incorporated in the transmitter housing or remotely mounted at distances in excess of 600 m.
The ULTIMA MOS-5E user interface is menu driven. In addition the instrument may be addressed via the Dual ModBus RTU interface which is based on the RS-485 standard. The ModBus output provides status, alarm, fault and other information for operation, trouble-shooting or configuration of the unit.